My monthly ñoquis del 29 post is either very late or extremely early. 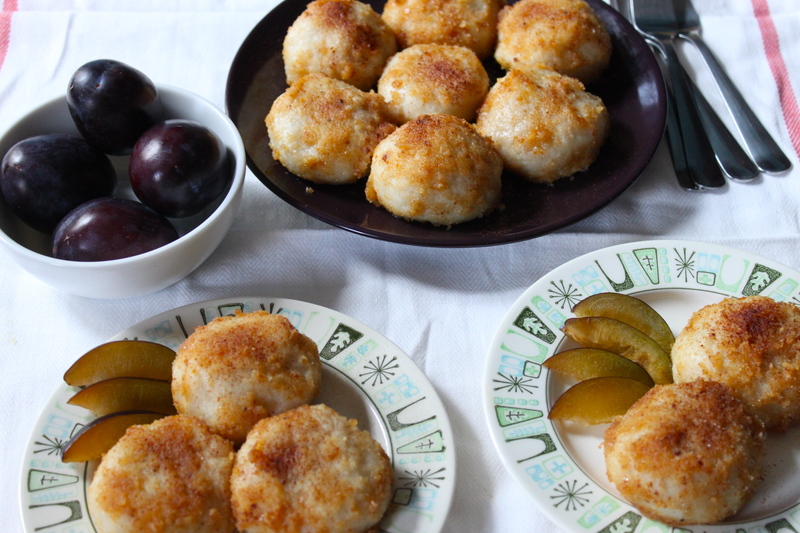 Meant to bring luck when eaten at the end of the month, I was unlucky the first time I tried to make these gnocchi di susine or plum gnocchis. A Triestian recipe similar to pierogis, they reflect the region’s blend of Mediterranean, Austrian, Hungarian, and Slavic cuisine. I thought it would be a great way to use the late summer plums that are filling the markets and fulfill my August gnocchi post – two birds, lots of stone fruit. I was thrilled when I found tiny Italian prune-plums that were perfectly ripe and just the right size. Following the recipe closely, I blanched them as directed – a mistake. They were supposed to split open just enough to remove the pits, be stuffed with sugar cubes, and folded into the gnocchi dough. When I checked on the plums a few minutes later they’d been blanched to a pulp – there was no putting them back together again. Disappointed but undeterred, I had some larger dark plums that were less than perfect, but cut down to size, might work. I found an alternative recipe from Mario Batali, ran out for more potatoes, and started from scratch. 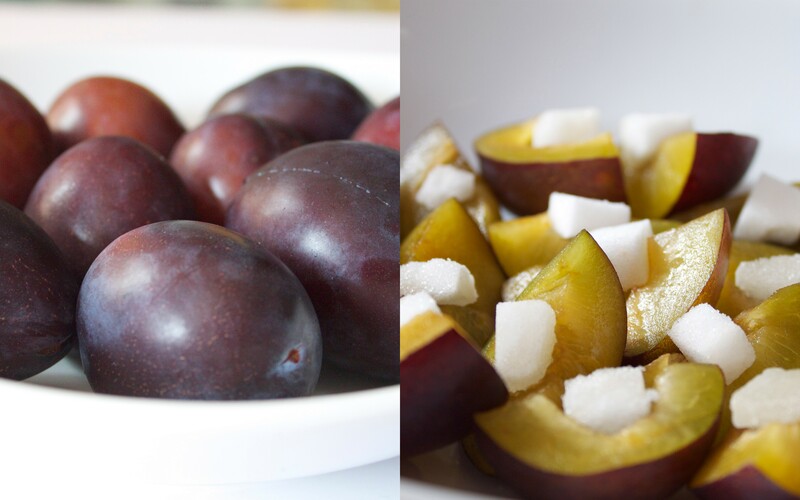 No blanching required, they were creamy, sweet and I loved the ways the plums and sugar melted together. Some times a little luck is a lot of work. 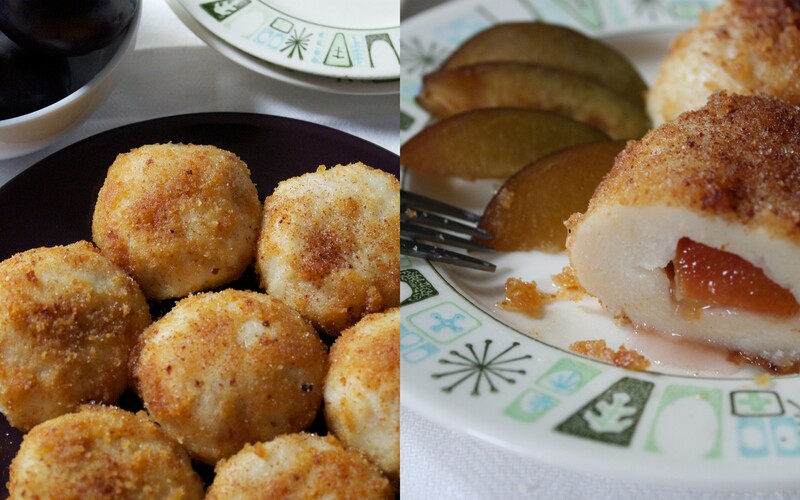 Adapted from this recipe by Mario Batali, they can also be made with prunes during if fresh plums aren’t available. Perfect for dessert, I think they’d make an interesting appetizer or side dish. Bring water to a boil with 1-2 tablespoons of salt. Pinch off a walnut-sized piece of dough and flatten into a 2 1/2 inch circle. Place a quarter plum piece stuffed with a half a sugar cube in the center of each round of dough (see note). Close the dough around the filling to form a smooth package with no tears. Repeat with remaining dough and plums. Add gnocchis, 8 or so at a time (so that they don’t touch) to the boiling water, stirring occasionally to prevent sticking. Wait for them to rise to the top and continue to cook an additional 2 minutes. Remove with a slotted spoon and drain well. Add to the bread crumb mixture and gently toss to coat. Place on a serving platter and sprinkle with remaining bread crumbs, cinnamon and sugar to taste. Serve warm as an appetizer or dessert. Delizioso! U going to Eataly??? Can’t wait what recipes you bring home after ur Italy trip!! Or France… Either is fantastic! I think I have to now. It sounds like they did a beautiful job. I’m not normally a gnocchi fan but this is making my mouth water! Oh god those look so good!